If you follow me on social media you’re probably wondering what my recent obsession with intu Trafford Centre is all about. Well as you are well aware, these fasts are loooong and they have been for a few years now. Energy levels are low and sometimes you just need everything to be right there in front of you. Wide variety of shops, restaurants, homeware and entertainment all under one roof with free parking and fab interiors thrown in. Oh and its a ten minute drive from home. So basically, it happens to be mine and Mo’s hangout if we don’t fancy the rain and parking rates in the city. I’ve always been a big fan of the centre – even though I hate shopping! I like all the really unusual things about it, like a) its always super clean, b) the staff are always really nice and c) I love the palm trees, they’re huge!! 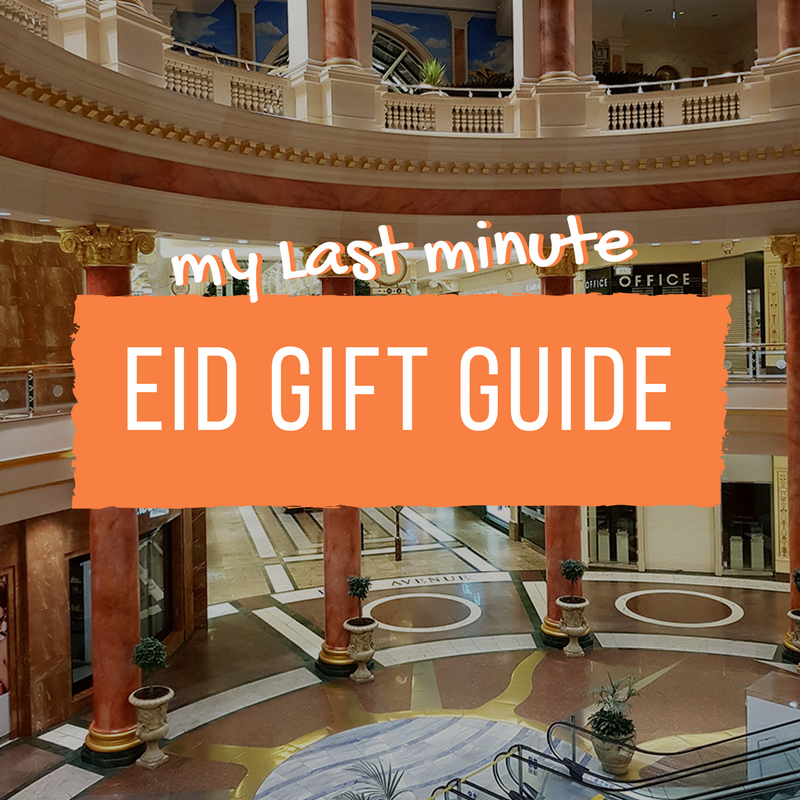 As a foodie, there’s plenty to eat (that deserves attention some other time) but right now I thought I’d share my yearly trip on the hunt for Eid things. I figured on the run up to Christmas when everyone’s advertising all their amazing gift sets I always do a post of my favourites, so why have I not done one for Eid??? Most bloggers I know love notebooks. Combine said product with inspirational quotes and boom you’ve found the perfect gift. Kikki K is a brand I was introduced to by a friend a couple of years ago and I’ve visited their store in Covent Garden when I can to stock up on supplies. One of my favourite products of theirs are the quote cards, I keep one on my desk at all times to brighten up my day. Now to my joy there is a Kikki K concession in Selfridges and the new stuff is fab! Anything from this range would make a good gift for any writer, planner, traveller or blogger (basically me). I know. This is a bizarre one to throw in and it’s not travel related. AND I don’t even really like chocolate – BUT I love the white chocolate box from Hotel Chocolat. Even though we were fasting, we like to waft temptation in front of ourselves every so often. So we walked in to look for Mo’s favourite treat box (I owed him one for turning up late). Sales assistant Max, showed us the amazing Eid sleeves. Loved them! And the store have created a whole section specifically for Eid – where all the chocolates advertised were vegetarian friendly and no traces of alcohol. Very impressed!!! And what a great gift!!!! Now I’m no beauty blogger, but I’m always on the lookout for products which are good to the environment and animal testing free. Oh and ones that are a bargain. So this here is my top beauty product tip (brace yourselves you won’t get many of these from me). Not only does the countdown to Eid calendar look AMAZING but it’s incredibly good value too! There’s a wide collection of products tucked behind the doors, including some of my favourites such as black musk body lotion and mango lip butter. And for all of us regular travellers, none of the bottles are larger than 100ml, perfect for packing away whatever your baggage restriction may be. All the backpacks I usually travel with are more outdoor type ones. I’ve always wanted to find myself a good looking equivalent that isn’t too small or too big, but one that would make a good handbag replacement for a city break. This one by Radley, Greyfriars Garden backpack, is simple, great size, comfortable to wear and a zip to secure. Not only are there pockets inside, but there’s also a secret little back pocket for those important bits you need to keep extra safe. Radley are also doing a personalisation offer at the moment where you can personalise a tag to go with it. With Mo being a perfume buff, no occasion is usually complete without a perfume purchase. So of course we were drawn into the Selfridges perfume counter whilst we were there. Mo has a great nose for smells and I asked him to pick out a few of his favourite Eid fragrances. He went straight to the Dior range to show me Oud Ispahan, a woody oriental style fragrance. He also recommended a number of bottles from the Francis Kurkdjian range. Amyris is one that he has his eye on, another one with woody undertones but with quite a light feel. Pop by and give them a smell! Added bonus, if you buy any perfume from the store you can take advantage of the free engraving too. Ok this last ones more of a practical gift, but it’s so necessary! At the start of the year I trialled out the world of packing cubes and frankly I will never look back. They are amazing!!! They keep everything organised, make it easy to find what you need, lightweight and just, well necessary. I don’t know how I ever coped without them?? These ones from Muji are even more amazing as they fold up into little packets so you can store them away when you don’t need them. Muji is a really great stop for travel essentials, from suitcases to travel bottles, they’ve got everything you can think of. There’s so much more available, but these were my favourite finds. Of course traditionally it’s nice to wear something new on Eid and intu Trafford Centre is by no means short of clothing shops! Let me know what you find or where you like to go for Eid… Not long to go now!